Kitchen! Kitchen! : Sweet cherry tomatoes .......roasted to perfection......at kitchen! kitchen! Sweet cherry tomatoes .......roasted to perfection......at kitchen! kitchen! Sweet delicate cherry tomatoes roasted to perfection. 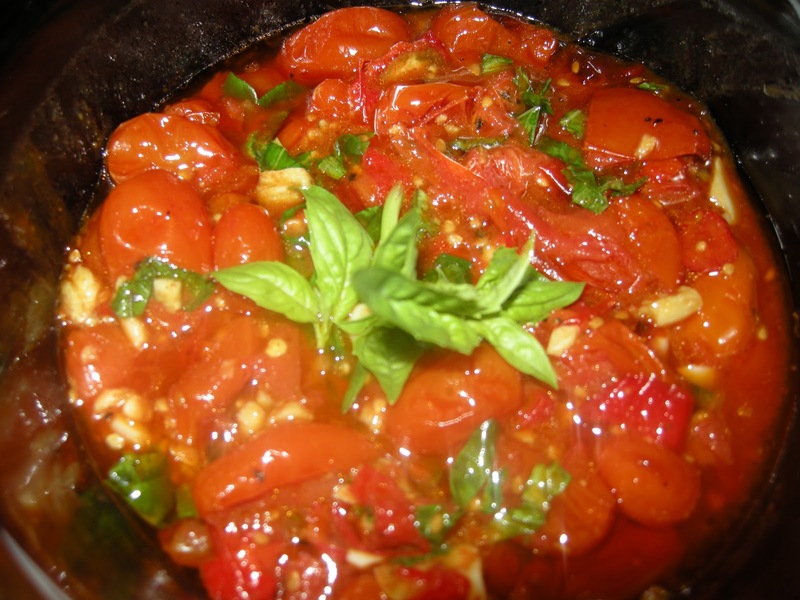 Place all the tomatoes in a roasting pan; sprinkle with salt, pepper, and a teaspoon of sugar then toss with 1/4 cup of olive oil. Roast in the oven for 50 minutes. 45 minutes into the roasting, switch oven to high broil for 5-6 minutes to brown the tomatoes. Let cool and drain to reserve all the liquid. Transfer the roasted solid tomatoes in a separate bowl. Pour the tomato liquid that you drained into a deep pan - (correct for seasoning) and simmer to reduce until thick (about 15-20 minutes). Pour back the reduced thickened tomato liquid into the bowl of roasted tomatoes and stir to mix. Add roughly chopped basil leaves and enjoy on toasted baguette . (you may sprinkle some parmesan cheese on top). Your patience will be rewarded with a rich and delicious tomatoes!! Fantastic as a crostata, or pasta topping.